As a professional office supply wholesaler in China, Deli is able to provide a variety of office supplies such as stapler, desktop set, paper punch, pencil sharpener, etc. This is our highlighter, you can find other similar products of different functions by clicking the below icons. Welcome you to browse and choose! 1. Special pen nip enable the highlighter has a smooth writing. 3. Colors are bright and light-resistant and water-resistant. 4. Flap highlighter and it holds comfortable. 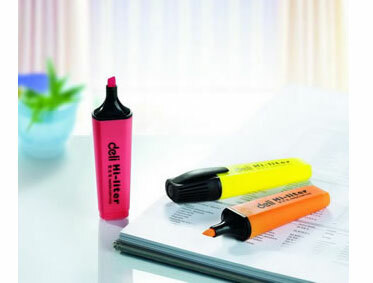 Highlighter, also a kind of writing tool, is widely used to mark on files, books, papers and magazines etc. Writing instruments like highlighter, ball pen, gel pen, whiteboard pen and permanent marker pen are all available in Deli, a professional office supplies manufacturer in China. » Paper Punch 1. Strict quality control system. 2. High quality material: ABS plastic and A3 hardware material. 3. The paper punch combined the functions of stapler and punch.